The Middle Eastern egg dish “Shakshuka” is a popular breakfast with the perfect ingredients for a bright start of the day! 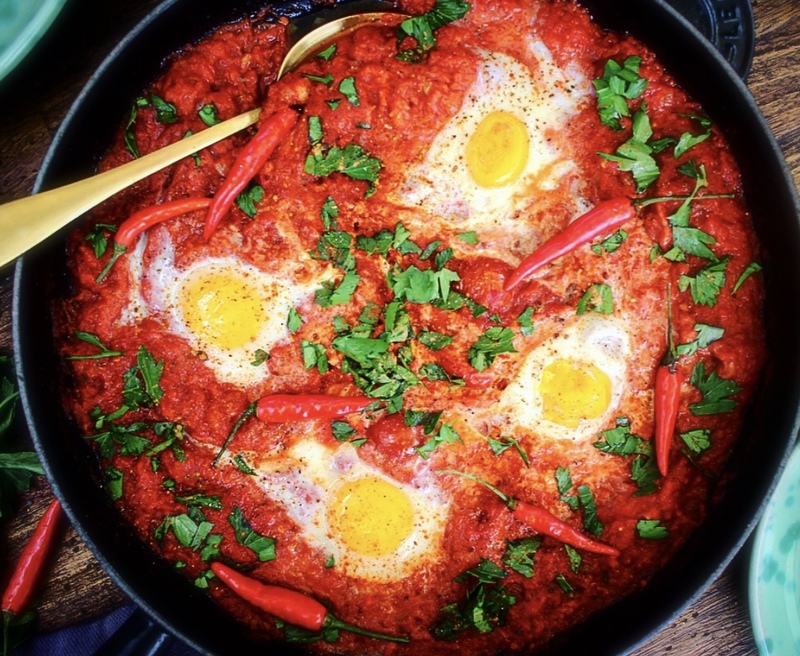 Eggs, tomato sauce and several spices are cooked at the stovetop to a “mixture”, like the Arabic meaning of the word Shakshuka translates. I enjoyed this wonderful vegetarian meal a couple of days ago in a café, which inspired me to make my breakfast eggs Israeli-style today and surely not the last time. Note: The word Shakshuka is derived from Arabic meaning “mixture”. Start by heating some olive oil in a medium-size pan. Sauté the onions & garlic until golden-brown, add the chopped chili pepper and the spices: Ground cumin, paprika and a pinch of cinnamon. Add the canned tomatoes into the pan and stir in the tomato paste. Season with salt, pepper and a pinch of sugar. Let the tomato sauce cook for about 20 minutes. Form 4 woles in the sauce an add the eggs, one into each whole. Use the stalk of a cooking spoon to stir the egg white into the sauce in circles. Add more seasonings if needed and sprinkle some fresh parsley (or coriander) before serving. Shakshuka is best enjoyed with warm bread that you can dip into the sauce! Posted in Food and tagged breakfast, Breakfast eggs, Israel, Israeli cooking, Middle eastern breakfast, Shakshuka. Bookmark the permalink.